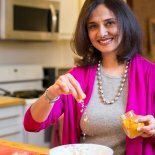 Ayurvedic chef Nalini Mehta views food and the cooking process as a means to nurture the soul.When Nalini Mehta's mother was diagnosed with ovarian cancer, it changed the way she viewed food -- namely, how it can be used to heal one's body. Now an Ayurvedic chef, Nalini has continued to use the principles behind Ayurveda in many different areas of her life. She views food and the cooking process as a means to nurture the soul and as an experience for the mind, body and soul. Recently, Nalini also received the James Beard Foundation Grant for Women in Culinary Leadership and is the creator of the The Happy Chef Program. This program is a unique and customized workshop in partnership with the International Associate for Human Values (IAHV), which creates frameworks and tools for chefs and employees in the food service industry to manage the mental and behavioral tendencies that feed stress, resulting in greater health, happiness and productivity. Listen as Nalini joins Dr. Taz to explain how she applies Ayurvedic principles to her career and life as a whole.